Mold processing refers to the processing of forming and blanking tools, and also includes shear and die cutting dies. Under normal circumstances, the mold has two parts: the upper mold and the lower mold. The steel plate is placed between the upper and lower molds, and the material is formed under the action of a press. When the press is opened, the work-piece determined by the shape of the mold is obtained or the corresponding scrap is removed. From small electronic connectors to large parts of the car dashboard can be molded. A progressive die is a set of dies that can automatically move a machined work-piece from one station to another and obtain a molded part at the last station. 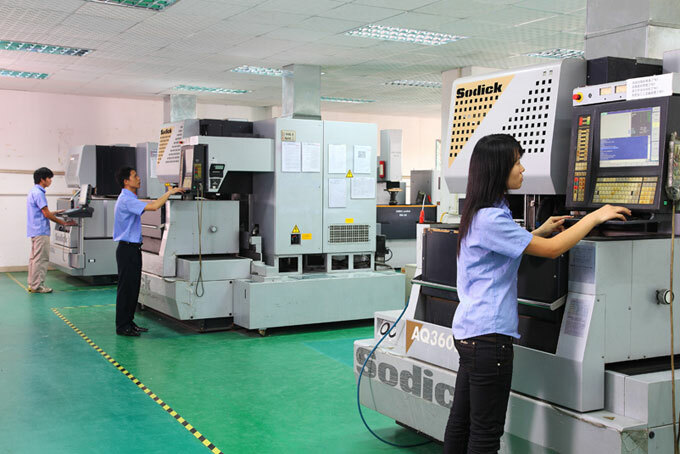 Mold processing technology includes: cutting die, punch blank die, composite die, extrusion die, four slide rail die, progressive die, stamping die, die-cutting die and so on. 1.Process preparation is concise and detailed, and the processing content is expressed as much as possible. 2.he key points of processing are important and the process must be emphasized. 3.Need a combination of processing and processing articulation. 4.When the inserts need to be processed separately, attention should be paid to the processing requirements of the processing accuracy. 5.After combined machining, insert parts that need to be processed separately, and the reference requirements for separate processing of process installation during combined processing. 6.The spring is the most vulnerable to damage during mold processing, so choose a mold spring with a long fatigue life. High precision machining requirements. A mold is usually composed of a die, a punch, and a die holder and some of them may also be multi-piece split modules. Therefore, the combination of the upper and lower molds, the combination of the inserts and the cavity, and the combination of the modules all require high processing accuracy. The accuracy of precision molds often reaches μm. The complex shape of some products such as car covers, aircraft parts, toys, home appliances, and the shape of the surface is formed by a combination of a variety of surfaces, so the mold cavity surface is very complex. Some surfaces must be processed mathematically. The production of small batches of molds is not mass production in batches. In many cases, only one batch is often produced. Processes many operations such as milling, boring, drilling, reaming, and tapping are always used in mold processing. Repetitive production the use of molds has a long life. When a mold is used for more than its life, it is necessary to replace it with a new one, so the production of the mold is often repetitive. Profiling processing there are sometimes no drawings and no data in the production of molds, and the profiling process is based on actual objects. This requires high imitation precision and no distortion. If the function of the numerical control system is stronger, the precision of the machine tool is higher, the rigidity is better, the thermal stability is better, and the copying function is provided. Our modern society is a society where science and technology develop, social progress, and industrial progress. Then there are countless products and daily products used in the daily life are used to mold the workers, because the use of the mold and other workers are extensive. Then in the mold company practice, due to the diversity of products, its mold division is diverse. The structure of the mold is somewhat simple and some are very complicated. But no matter what the mold is, its structure is composed of the following components: Its working conditions include positioning and guiding parts; opening and closing mechanisms, unloading mechanism, preheating and cooling mechanism, feeding mechanism and connection. Simple molds usually have only working parts and connection mechanisms, the simplest ones have only working parts, and complex molds contain all the above mentioned mechanisms. This is the progress of the mold production process in the industry, and then what is the mold drying pattern? The so-called mold drying pattern is mainly based on the mold on the basis of the process of drying lines; the mold is further construction, in such processes to make the product more advanced development. Sunburn is also called biting flower. It is mainly a type of process in the surface treatment of plastic molds. It is a kind of processing technology to make concave and convex etching of mold cavity in order to achieve the effect of product surface beautification. In the process, if only small and natural distribution lines, such as matte surface, are needed, the method of electric discharge machining can be used. However, this process can also be used to improve the problem of a little product and front mold. All in all, the products and supplies that come out of the molds are all so exquisite and perfect.